Robust steel side frames with steel cross beams and precision linear rails. Pneumatic fittings serve to ease the operation of the unit. Same sleeve system and mechanical equipment as that built in the rich equipped Falcon as well. The measurement system memorizes 20 base positions. 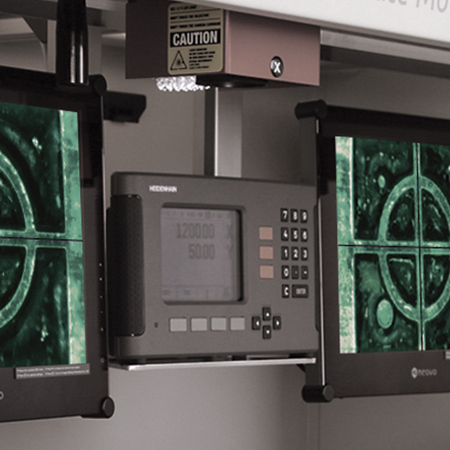 Large colour displays exteriorize the exact positions of both cameras. 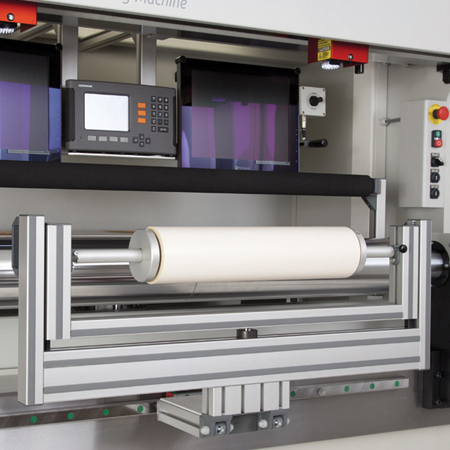 The simple and reliable electronic system provides an exceptionally reliable, excellent value for money plate mounting machine for the printing houses. 15 inches colour LED LCD displays with electronic generated crossline. The colour system is rich in shades and provides excellent image quality regardless of the tape or plate colours to be mounted. The crosses are suitable for mounting plates with microdots or register crosses configuration. Magnification on LCD displays: x60-x70. Focus of the optics can be adjusted by joysticks. Plate is lit by LED lights under the optics. The camera carriages can be moved left and right by the handles found on the camera case. The whole camera carriage assembly is covered by the machine frame and the lenses are not visible. 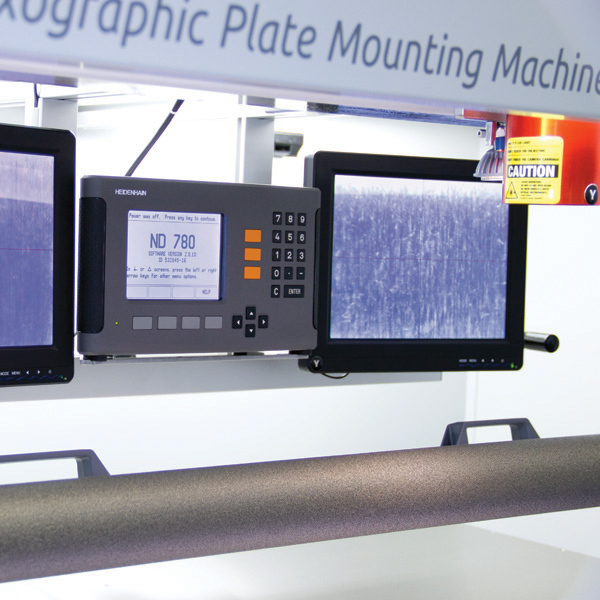 Only plates with register marks or microdots found at least 130 mm distance from each other can be mounted with the mounter. For easy position determination of cameras a red laser light indicates each of the actual camera position on the sleeve face. The camera coupling device drastically speeds up the mounting process in case the customer is mounting several same size plates next to each other on the plate cylinder surface as it speeds up the camera setting times. You basically lock the two cameras together and then move them together to the next position instead of moving each camera one by one. All that needs to be done is a locking arm has to be turned to lock the cameras together. The simple lead-on table is made from a stainless steel covered 650 mm long guiding plate. 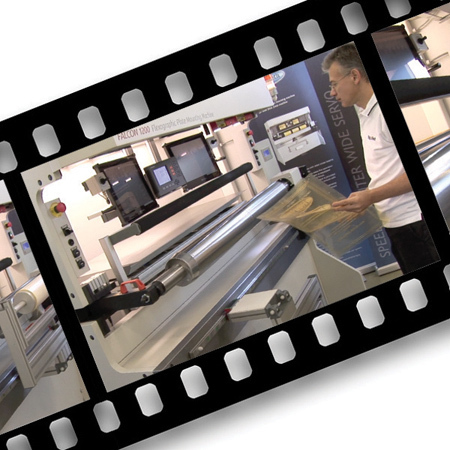 It supports printing plates along their full width during the initial sticking and squeezing. The vertical movement of the lead-on table is realized by the totally closed, compact, German made RK Rose&Krieger electric lifting legs. The synchronized drive granted by the control system developed by FlexoTech. There are precise and massive horizontal and vertical linear rails for guiding the lead on table motion. Operation of motorized lead-on table is via push buttons found on the control panel. Numbered push buttons from 1-3 with memory unit to store the 9 mostly used print repeat data. Up and down arrows for grade less height adjustment. The construction allows completion of the standard simple lead-on table with fixed 9 height memory by optional height positioning unit. This last adjusts the level of the lead-on table directly above the sleeve after the repeat length was entered to the system. 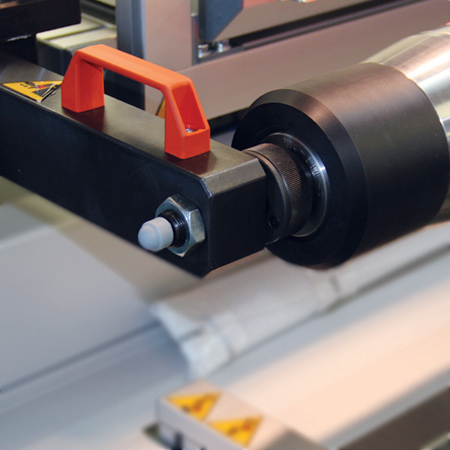 The lay-down roll integrated into the lead-on table allows pneumatic smoothing in full width of the sleeve. The lay-down roll is a dia. 70 mm soft plastic foam covered cylinder. While selecting suitable cover material for lay down roll the material of the printing plate and its thickness had to be considered. 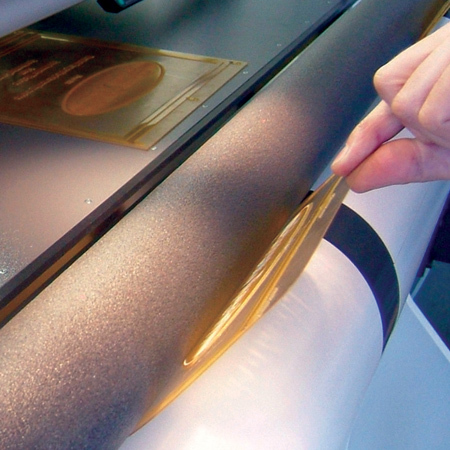 The flexible plastic foam – in contrast to other solutions – ensures the best condition for plate application without air bubbles and distortions. The optimal pressure in the power cylinder for squeezing is only 3 bars. 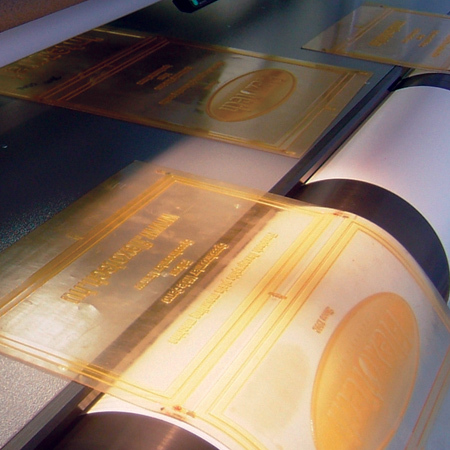 Using higher force induced by higher air pressure can cause damage to the printing plate that is why not recommended. In case of neccessity, applying of double side adhesive tape with micro channels helps equal stronger sticking without air bubbles. Squeezing by manual roller is recommended only in exceptional cases to eliminate air bubbles, because of uneven squeezing force distort the plate and does not allow standard mounting conditions. By use of lay-down roll the application of double side adhesive tape and printing plate proceeds standard way means under equal pressure and speed for all sleeves. The machine operator will not have a chance to make any mistake in sticking procedures while the the accuracy and precision remains same at every case. 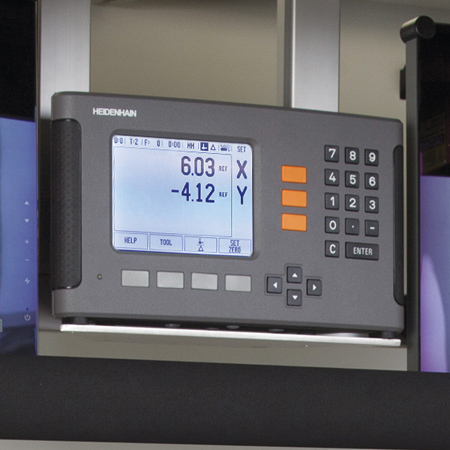 0.01 mm backtracking precision Heidenhain measurement system. Large display showing position of both cameras at the same time. Stores 2x10 base positions in memory even after system is shut down. 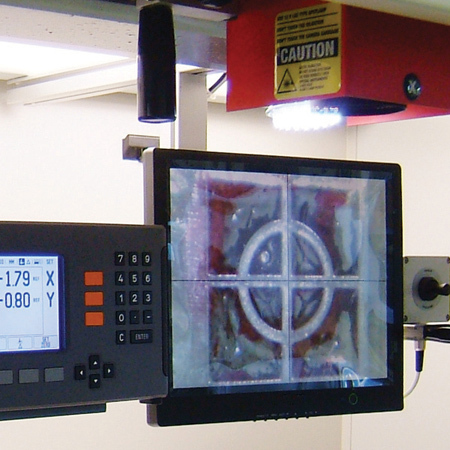 System is made up of Heidenhain display, an optical scale behind the upper camera beam and scan heads placed on each camera carriage. There is a gap of 0.15 mm be- tween the scale and the scan heads. This means that even after several years of usage the precision of the measurement system is not affected by wear. It is possible to use the system in either mm or inches. This provides a much quicker and really user-friendly work flow. Both hands of the operator remain free for mounting. The two-way motorized turning is controlled via 2 foot pedals. The electromotor turning is not suitable for circumferential positioning and is for usage for applying double sided tape and mounting plates. The electromotor is with clutch system and a ribbed belt. Opposite the dividing disc between the two right headstocks – is a pneumatically moving pin, which fits in with the ”V” shaped profiles of the disc. Ensures the division of the plate cylinder into 2, 3 or 4 even parts. It is also used to fix the air mandrel of the sleeve system in position during the sleeve or sleeve adapter change. Pneumatic system operated and controlled via push buttons. Double sided tape is supported on aluminum shaft by cone shaped adapters on each side. It ensures precise and user-friendly application of tape. Tapes with core diameters between: 35-95 mm can be used in the support. The unit moves on a linear rail and can be removed all together to gain comfortable access to the whole cylinder face. The tape support can be folded down easily providing maximal space for further mounting cycles. We propose its use for sleeves with working width up to 900 mm, where the adhesive tape applied in one piece unwound directly from its roll. In case of wider sleeves it is better to apply adhesive tape also in one piece turned crosswise, instead of fitting several adhesive strips near each other. That way gaps between the strips can be avoided and also the lead time of the tape application will be much shorter. However, the whole tape application operation could be outsourced to a MASTER DMT tape mounting and plate&tape removing machine in order to multiply plate mounting capacity of the plate mounter machine. Makes it possible to change sleeves in the mounting machine. The cone head of the sleeve arm unit fits in precisely with the built-in air mandrel left shaft. The arm is folded in and out by hand but the closing and opening of the cone is done by pneumatics. The bearing sites of the built-in air mandrel are individually fitted to the housing with an accuracy of 0.005 mm allowing integration and rotation of the air mandrel as precisely as it is mechanically possible. 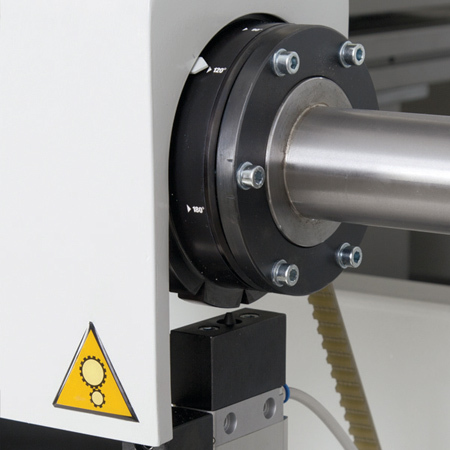 In the case of repeat length greater than 900 mm a shaft lift assists the cantilever sleeve arm operation to ensure extremely long lifetime for the conical support head stabilizing the air mandrel. This machine is excellent solution for low cost printing houses. Falcon Light has the same mechanical design and massive frame as that built in the rich equipped Falcon as well. Its specification includes all the units which are necessary for precise and fast plate mounting without any problems. Because of its favourable price this machine is the optimal solution for label printers using sleeves over 600 mm face width. AIR MANDREL DIAMETER OR STORK NO. We will send you a password to view this video soon. Thanks for your interest and patience in advance. Registration and password is required to view this video. I have a registration and password. I do not have registration. 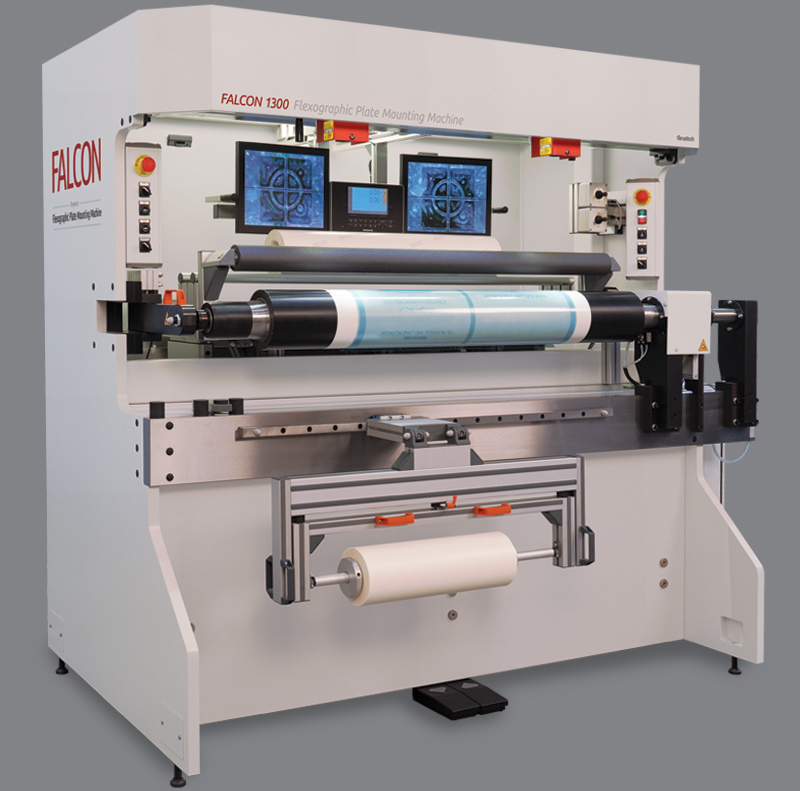 flexographic plate mounting machine. Registration is required to view this video.